This romantic thriller series takes the reader to foreign locations for action, adventure, and thrills as our savvy heroines interface with dangerous men to solve problems...dangerous ones. Helicopter pilot Joni Bell believes her life is once again under control after a failed covert rescue mission two years ago cost the life of a dignitary’s child. Out of the US military and relocated to South Africa, she test-flies a prototype Special Forces craft unaware her past has already caught up. Her skill set is just what the CIA and South African government need to address a sensitive international issue brewing in the struggling country across the border. They coerce her into flying the craft into Zimbabwe to smuggle out top-secret information secured by wildlife manager Ian Taljaard. Once in the country, Joni discovers she and Taljaard have different visions for the rapidly changing mission. Her presence in the country is betrayed, another child is put at risk, and a deadly Zimbabwean operative and his team pick up their tail. As they evade capture in bush country, their encounters with the enemy reveal Ian is more mysterious and dangerous than his bio disclosed. With deceptions rampant on both sides and stakes rising, it will take both their skills to slip under the radar of a deadly enemy and escape. Joni Bell’s life as a former American military helicopter pilot has grown complicated. The only way to rescue a spy she’s come to love and keep a promise to a child whose father is a political prisoner in Africa is to assist the CIA. Can she do all this while keeping one step ahead of a traitor in her midst? Joni flew helicopters in the Army until two years ago when she got out and took a job across the ocean flying for a test program in South Africa. She is flying a one man Special Forces craft that acts like part helicopter, part gyrocopter, part plane. It is still in the developmental stage. With family and friends far away, she stays busy with work and the few buddies cultivated there. Ian Taljaard, pronounced "tall yard," has a complex background coming from Zimbabwe where he grew up during the transition in power of the government. The early days had their troubles (political wise), but the turn of the milinneum mixed with government corruption, brought sweeping changes and plunged the country into economic chaos. His father is a former Selous Scout and passed along much of his training to his son. Ian had a chance to study in Britian, and came back to Zimbabwe because of his love of wildlife and hopes to see it preserved in the deteriorating country. There are a few gaps in his background that perhaps explain some of his other unique talents. Mike flies helicopter tours in southern Zimbabwe and on occasion to the world famous Victoria Falls. He's an old friend of Ian's father and in recent years has helped Ian handle a few "problems." Bram is a South African helicopter pilot who works with Joni in the project office testing Taz, the Special Forces craft being developed with funding from the Americans. He was the only test pilot on the project until the Americans asked for an American pilot to be brought aboard. Lemmon works for the CIA. He knew Joni from missions in Colombia, and had been running the operation to retrieve a defense minister's son, when her military chopper was brought down. Now he has turned up at her civilian job in Africa. His presence doesn't bode well for Joni, who blames him for the death of the minister's son. Obergen runs the Taz project office and seems more interested in the bottom line than his pilots. Joni and Bram work for him. Tinashe Kagona is a man with a big ego and a thirst for power accompanied by the wealth that can be acrued with it. He is the chief operative of the Central Intelligence Organization (Zimbabwe's version of the FBI, CIA, NSA, and whatever other intelligence organizations you can think of combined). He will support the politician most likely to keep him a powerful position. Chaipa is Kagona's protege and is doing well following in his boss's footsteps. Sipho, pronounced "See-po," is the son of Edward Mukono, the finance minister of Zimbabwe. He is part Ndebele and part Shona, speaks mostly Ndebele and Shona, and a little English. His mother grew up with Ian. Have you read Sandy's books and would like to leave a review at one of the main retailers? Go here. The truth is never what it seems. This beautiful Stearman sat on a grassy field at Sun-N-Fun Air Show several years ago. 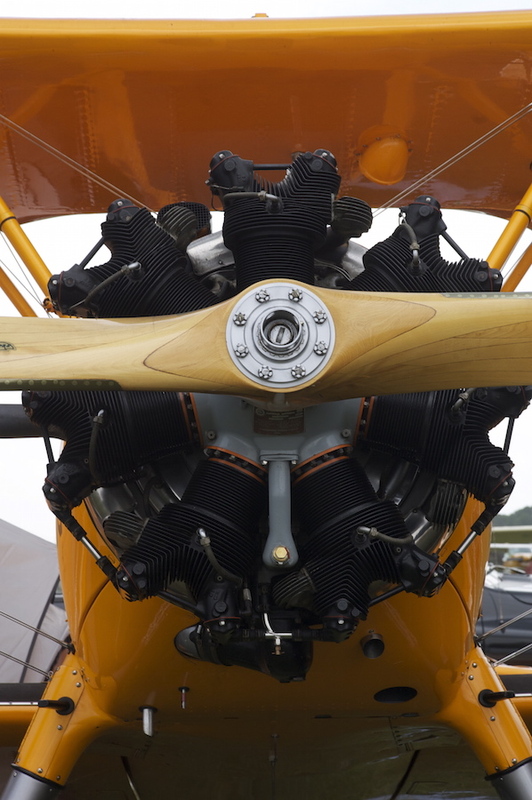 There is something about this radial engine and wood prop that brings flying dreams alive.